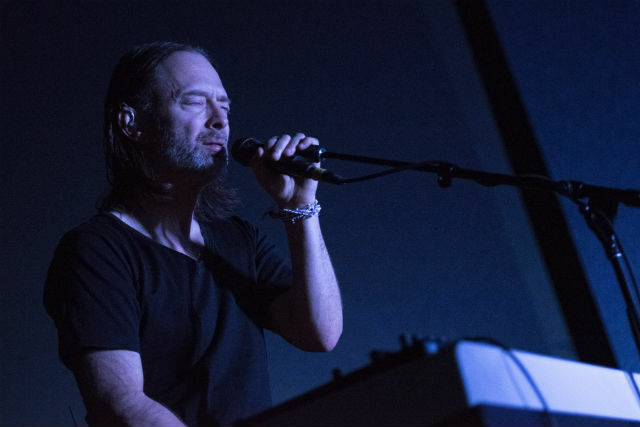 Published Dec. 6, 2018 at 8:02 a.m.
Because I've somehow managed to miss Radiohead every time the band has performed anywhere near Milwaukee and Chicago, I jumped at the chance to see frontman Thom Yorke when he performed at the Riverside on Wednesday night, even though I know the two experiences are not at all the same thing. The electronic performance, created in tandem with longtime collaborator Nigel Godrich and with projected visuals provided by Tarik Barri, was part of the trio's "Tomorrow's Modern Boxes," tour, named for Yorke's second solo set, released in 2014. The tour is the second for this trio. Godrich has collaborated with Radiohead on all of its records since the band's second, "The Bends," released in 1995, on which he worked as engineer. He has also worked with Yorke on the latter's solo discs and the two also toured together in 2015. At the performance – at which each of three performers manned a rather space-age looking pedestal full of equipment – Yorke sang and played kayboard and both he and Godrich manned the guitar, bass and laptops, performing songs from "Tomorrow's Modern Boxes" and Yorke's solo debut, "The Eraser," from 2006, as well as from the Atoms for Peace "Amok" side project and from Yorke's recent soundtrack for Luca Guadagnino's "Suspiria" film. Radiohead fans hoping to hear music from that band will have left disappointed, as Yorke and company played none. The evocative visuals that accompanied the music are the work of Dutch audiovisual composer Barri, who is based in Berlin, and who worked from one of those pedestals on stage. Like Godrich, Barri also collaborated with Yorke on the 2015 tour and he also did video work for Atoms for Peace. Watching the trippy images float across the stage as the music filled the room – which looked nearly sold-out – I couldn't help but wonder if this was a bit what it was like when the Mark Boyle Sensual Laboratory projected its psychedelic images behind the Jimi Hendrix Experience at The Scene across the street 50 years ago. Though I've never experienced Radiohead in concert, I have seen Yorke perform solo before, at an in-store appearance at Tower Records in Chicago when the band was touring in support of its debut album, "Pablo Honey." 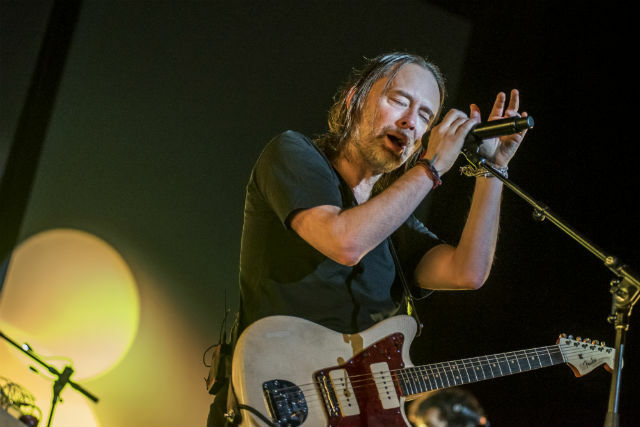 To first appearances, of course, the music at these two shows would seem divergent – the urgent, high-tension rock of early Radiohead and the trance-ish, ethereal, rock-inflected electronica of Wednesday night – the experiences were, in fact, similar, with Yorke pouring himself into the music, which in both cases was powerful and emotive. London cellist and film composer Oliver Coates opened the show, with a dark, occasionally frenetic set of cello backed with electronic tracks that created an edgy, Bernard Herrmann-style tension.